Only someone with the fiction instinct, skill and sense of humour of Empar Moliner could have written a story collection like I’m Doing All This Because I’m So Scared, a literary jewel that will move and entertain the reader from beginning to end. These stories portray the maladies of our time in a unique, distinctive way. With lucidity and sarcasm, they show how commonly we are presented with absurd difficulties, teach us to live without fear and even how to love without hurting the object of our affections. They also demonstrate how easily our flaws can turn into neuroses such as the ones that affect the characters in this book: gastronomic snobbery, the dangers involved in running through the forest, panic at seeing our children suffer, couples who no longer laugh together and the frantic seduction techniques of people who can’t bear the thought of ending up alone. Moliner, acid as ever, shows us the desperate lengths to which fear drives us. Because we often find ourselves laughing, running or drinking out of fear. 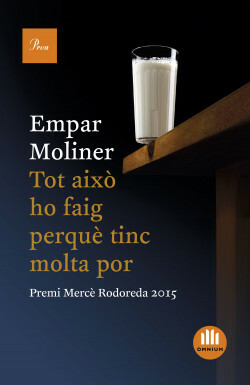 Few writers can depict the uncertainty of our time like Empar Moliner.